A true childhood favorite in reading and watching. I loved the original Black Stallion book and film. There have been so many versions over the years and I always tend to watch them all because they were a pivotal part of my childhood. I was super happy to learn the Return had been chosen by Twilight Time for one of their special edition 3,000 Unit Blu-ray's. I have often felt this is an over looked older classic, specifically for the whole family. It’s a wonderful story with great performances and equally memorable moments that stand out in cinema in the family kid oriented reality. I think one of the reasons it stands out also is that they got the original kid actor Kelly Reno to return to the part of Alex Ramsey, which he also played in the original 1979 film. It’s always a plus when doing a sequel to get the original players. It’s never the same to me and in reality destroys the process of the film. It’s sad that Alex Ramsey stopped acting in 1985, I always thought he was a really good performer. But sadly it really wasn’t his choice to stop acting, he was in a really bad car accident that took him away from the movie business. Ultimately recovered, but never was able to re-enter the movie business and that’s really a true shame, he had a fun natural talent of acting, and both Stallion movies, showcases that. Also keep an eye out for a very underrated African American actor the great one of a kind Woody Strode who starred in over 90 performances through his career. He was also a side character or a part that was pivotal and memorable as a side character. He starred in many John Ford films. Many remember him fighting Kirk Douglas in the masterpiece classic 1960’s Spartacus. Starred in one of my favorite films and westerns of all time the masterpiece classic, one of a kind 1968’s Once Upon a Time in the West. A personal childhood B-movie favorite he starred in was the Drive-In classic 1977’s Kingdom of the Spiders. He was in so many cult style films, from 1972’s The Italian Connection, 1976’s Keoma and so many others, just always a treat to see him perform. This time around Alec and his mother on the farm start to have strange things happen, then the barn burns down and Black the horse is stolen. Soon Alec learns that The Sheik known as Ishak has stolen the horse in thinking he owns it. Soon Alec is on an adventure stowing away in a plane going to Casablanca. Alec is going to take on the Sheik to save Black. Very interesting is this is directed by Robert Dalva, which this is his only movie as director, he directed a couple of TV shows after this but basically went to other movie making roles such as cinematographer and editor. Which is interesting to note about the editor role is he has been a part of some high quality big budget films such as 1992’s Raising Cain, 1995’s Jumanji, 1999’s October Sky, 2011’s Captain America: The First Avenger. That is what is also interesting, is he was editor on the original The Black Stallion (1979) and went on to direct the sequel. Now the sequel is nowhere near as great as the first one but still is very entertaining for the whole family, in that movie night experience. Twilight Time has done a wonderful job in transferring this to Blu-ray. Pop you some popcorn, rent the original one and have a double feature with the family and experience great adventure that is perfect for the entertainment of the family. 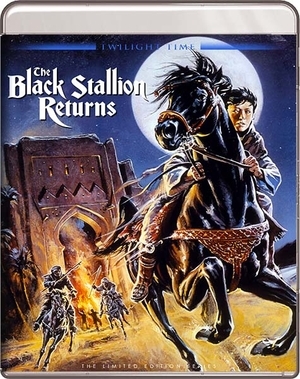 The Black Stallion Returns is a great fun treat to experience all over again and Twilight Time has done another great job in giving pure entertainment, and allowing the viewer to experience an older film on a new outlet that is worthy to praise. Another great example of restoring and transferring and taking care of an older film and giving it a new outlet that should be experienced. Audio is perfect sound quality, crisp and spot on. The video is vibrant and comes together once again looking new all over. I am not one of these reviewers that pin point small spots or asinine bickering over things, I look at the beauty put into crafting the older films on new outlets to experience, and Twilight Time never fails in giving the movie loving world important examples of how to treat cinema. Isolated Score Track. Composing the music for the film is another worthy to be talked about persona in the film world, Georges Delerue. He died young at the age of 67, but left a vast array of excellence to be remembered in the film world. He had an amazing total of well over 350 composing jobs. From such greats like, 1959’s Hiroshima Mon Amour, 1963’s Contempt, 1970’s The Conformist. The amazing 1983’s Silkwood, that I wish someone would honor and bring out on Blu-ray. 1986’s Platoon, 1989’s Steel Magnolias and many, many more from Composing, to musical director, to conductor. He was an amazing musician, and he shines on this isolated music track. Another fantastic special feature. Yet again another priceless Twilight Time Blu-ray that is my viewpoint a must own, and must experience Blu-ray, specifically for the whole family. Kids will love it, adults will love it, I loved it, experiencing it all over again.